Lodge Bread has some really good coffee. While it might be surprising that a shop whose focus is artisanal breads kills it on the coffee front, it’s really just an indication of how Alex Phaneuf and Or Amsalam do things, which is quite well. 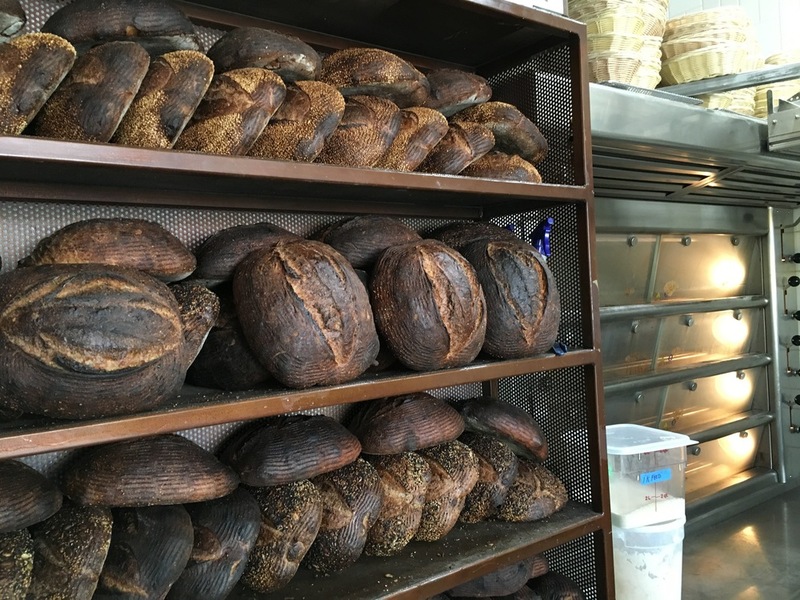 The two opened Lodge Bread on Washington Boulevard in Culver City in November, and the rows of dark round loaves lining the window portend bread that’s hearty with a crisp, almost burnt crust. Crack one open, though, and there’s a soft, chewy airiness, whether it’s country loaf, whole wheat or ancient grain. There’s not a lot on the menu. There are the whole loaves (no baguettes), a couple of toasts, a few baked goods that go well with the coffee, and that’s about it. Still, the bakery has developed a following, landing on Eater’s recent hot list and garnering writeups in LA Weekly and the LA Times, and seeing a steady stream of customers coming through its doors. Phaneuf and Amsalam didn’t exactly set out to be bakers. They’ve both done time in the kitchen, Phaneuf at FarmShop and AQ in San Francisco, and Amsalam at Mezze and Spago, along with private gigs, but their meeting at Goldie’s in West Hollywood, where they and their pastry chef Alan Craig worked, set things in motion. Phaneuf and Amsalam started baking there for the restaurant, but where they really started to get serious about bread is about 5 minutes away from the storefront, in Phaneuf’s backyard. The somewhat illicit bread eventually ended up at local spots, Plant Food + Wine, Dudley Market, and Danny’s Venice, which helped reinforce their need for a dedicated space, and they now have plans to sell to Goldie’s and do something for Sarah Kramer and Sarah Hymanson of Madcapra for their new concept—“We have a lot of friends [in the business],” Amsalam explains. Despite the attention, the goal is to keep it “simple.” That means starting with whole grain flour from Central Milling and then staying “true to the technique, all naturally leavened. We don’t really fuss with it that much. We don’t play around to make 15 different types of loaves and baguette and buns. We do four or five different types of bread and that’s pretty much it,” says Amsalam. This being LA, you can get their bread as artfully rendered toasts, topped with something a little sweet like cashew butter or more savory like avocado and radish. There’s also a small but delectable selection of baked goods, which deserve some serious attention, from Craig. The cinnamon rolls, for instance, are made from 100 percent naturally leavened whole grain brioche, which Amsalam says is a rarity in LA. They’re huge—one roll easily feeds two—and mighty satisfying, as is an orange olive oil cake that made an appearance one day, and a giant chocolate cookie tempting from behind glass on another. They also do a pizza night (Sundays, starting at 5 p.m.), and “sometimes we get bored” says Amsalam, “We’ll get some cool produce from our purveyor. He’ll bring us some cabbage, we’ll make sauerkraut …” Amsalam drifts off, but it’s clear it’s harder for them to just bake bread than they let on. Oh, and about the coffee. “The coffee program is very near and dear to us because we both love coffee. We drink like 20 cups a day.” They get it from De La Paz in San Francisco (Phaneuf has a friend connection there) and have a gleaming vintage-style Electra for espresso that was a gift. Their friends and family played a part in other aspects of the restaurant as well. The pottery used in the restaurant is from a friend’s shop, Silica Studios in Palm Springs. And the tile tables were crafted by Phaneuf and Amsalam’s fathers. One of the most striking things about the place, however, is its lack of pretension despite the high level of execution. There’s artfully potted succulents and rows of baking and cookbooks from some of the country’s top bakeries and restaurants on high shelves above the tables, but there’s no attitude from behind the counter. 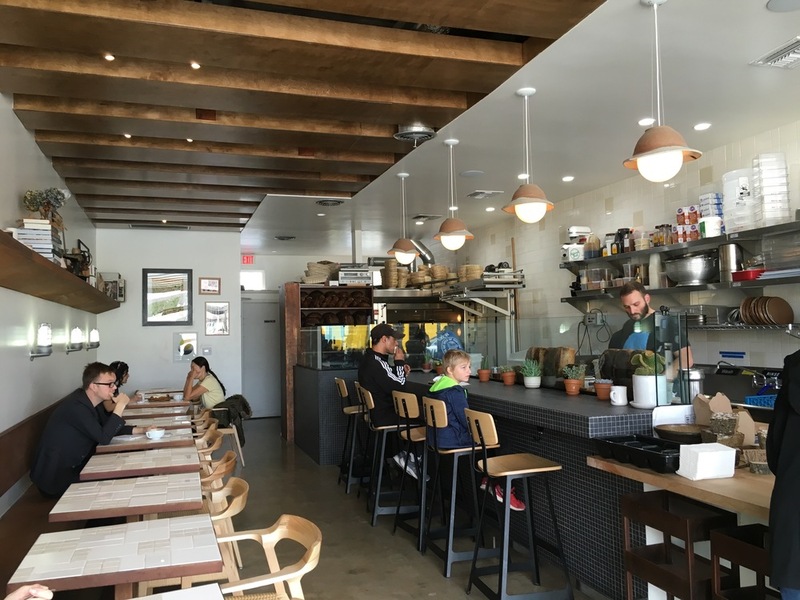 And the customer mix feels like a genuine reflection of the neighborhood and block that’s not a curated as other nearby, more gentrified strips of Venice and Culver City.